Our Easirent Birmingham City branch, located right in the heart of the city, is just a 5 minute walk from New Street train station and the famous Bullring shopping centre. The branch team welcome you to our fantastic city where we have a superb range of hire cars, professionally cleaned and ready for collection. Whether you require a vehicle for business or pleasure, choose Easirent for the lowest prices and best service. You can contact the manager, Martin directly on 0121 516 6505 where I will be happy to answer any questions you may have on car rental and don’t forget to book direct on our website for the best price. Arriving at Easirent Birmingham City Centre: The branch address 2nd Floor Office, 5 Lower Temple Street, Birmingham B2 4JD. Car Drop Off Instructions: Please call the branch on 0121 516 6505 who will be able to instruct you on where you should drop off your hire car. Arriving by train: Our branch is situated just 5 minutes away from New Street train station which is one of the UK’s busiest with links to London, Manchester, Liverpool, Newcastle, Nottingham, Cardiff and Scotland. After you have arrived at New Street, exit and head south-west on Station Street then turn tight towards Stephenson Street after 260 feet. After a short walk north and then left on Stephenson Street – Temple Street is just a right turn further ahead. We are located at 5 Lower Template street on the 2nd floor. Arriving at Birmingham by air: Flying to Birmingham airport? 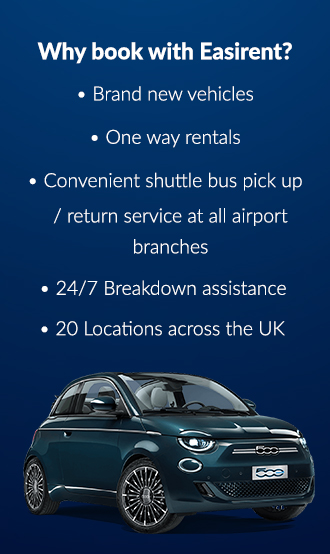 For your convenience, please use our Birmingham Airport Car Hire branch. After landing, simply exit and call the branch who will arrange pick up via shuttle bus. Arriving by bus: From Birmingham Coach station at Mill Lane you can catch the number 3, 5, 6, 31 or 37 bus routes which stops at Digbeth Station (Stop number DS5). At Digbeth catch the number 37 to High Street (Stop number BS16). From there our branch is a 6 minute walk through Carrs Lane, Union Street, a left turn on to Corporation Street, right turn on New Street and finally turning left on to Lower Temple Street. With our price match guarantee you can be sure of the lowest price for car hire in Birmingham – call our reservations team or book direct with us on the website – we have a full range of vehicles from small cars to family hatchbacks and business class saloons for our corporate customers.